In summer season the most awaited fruit is Mango for all of us. And definitely in both form Raw and Ripe Mango. Raw mango whenever we think about this the first thing used to come in our mind is Pickle and Chutney. And I think with Mango we can make so many different types of Pickle. Some pickles are sweet and some pickles are sour. But in every way they are just mouthwatering. 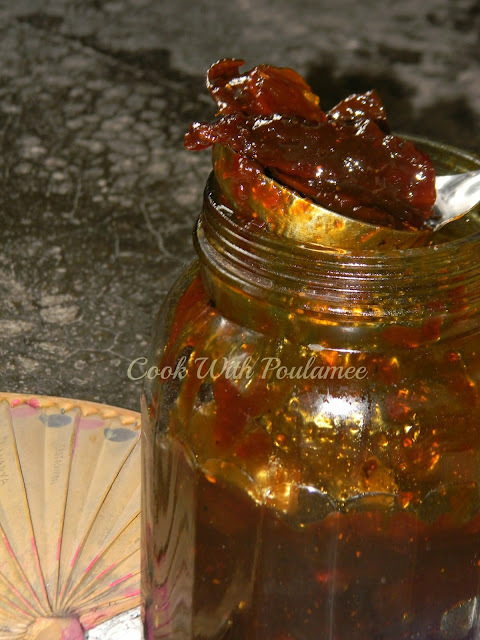 My maa used to make so many types of pickle and among all of them my favorite one is Sweet Raw Mango Pickle with shell. Basically she learnt the recipe from my grandmother. The basic ingredients are Raw Mango with shell, and jagerry. And if you keep the pickle in a glass bottle then you can keep this for long. Sweet pickle is more popular in West Bengal rather than the other part of India. 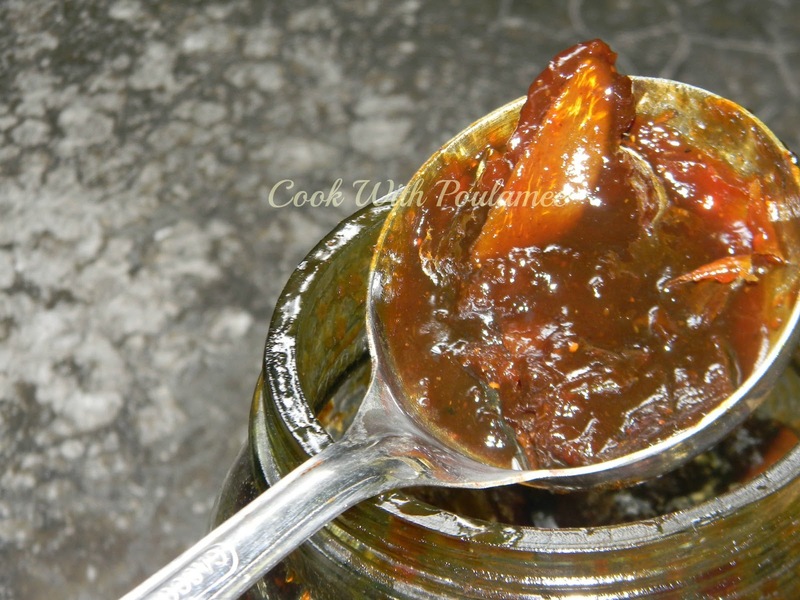 If you are a pickle lover then you are sure going to love this. 2.Jaggery or Jhola Gur: 1 kg. 4.One tea spoon turmeric powder. 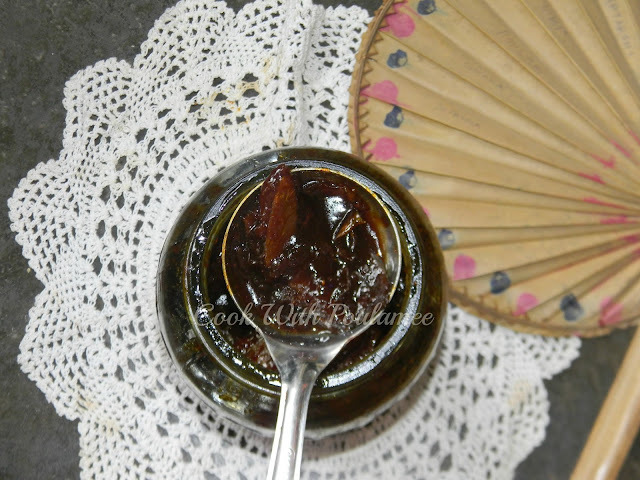 5.One tea spoon fenugreek seeds, One tea spoon Fennel seeds. 7.Three to four table spoon mustard oil. Slice the raw mangoes with the shell not too thin not to thick. Now boil the mango slices (switch off the gas when the water start boiling), keep it aside till it become cool and dry completely. 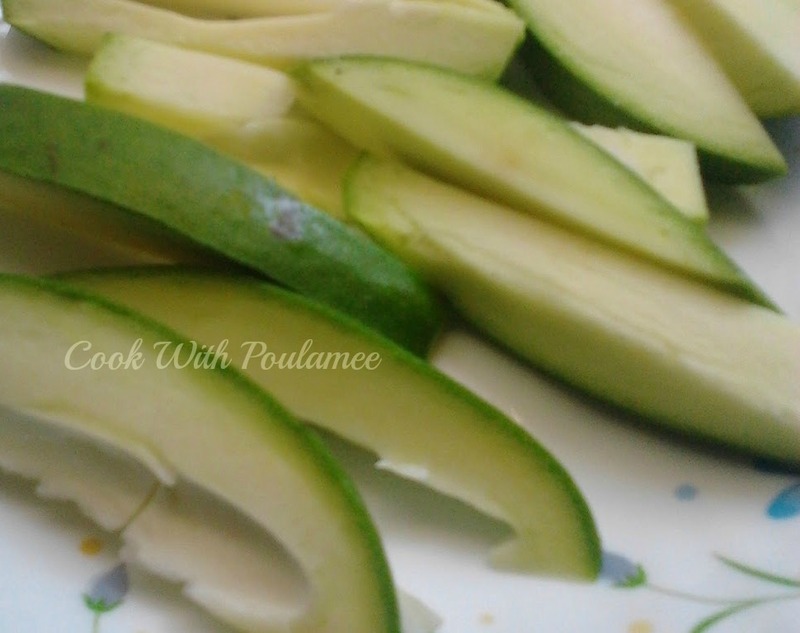 Now sprinkle some salt and turmeric powder into the mangoes. Dry roast and grind the fenugreek seeds and fennel seeds, keep it aside. Now add the mustard oil in a big vessel and slowly fry the mango pieces (few at a time). Keep it aside. 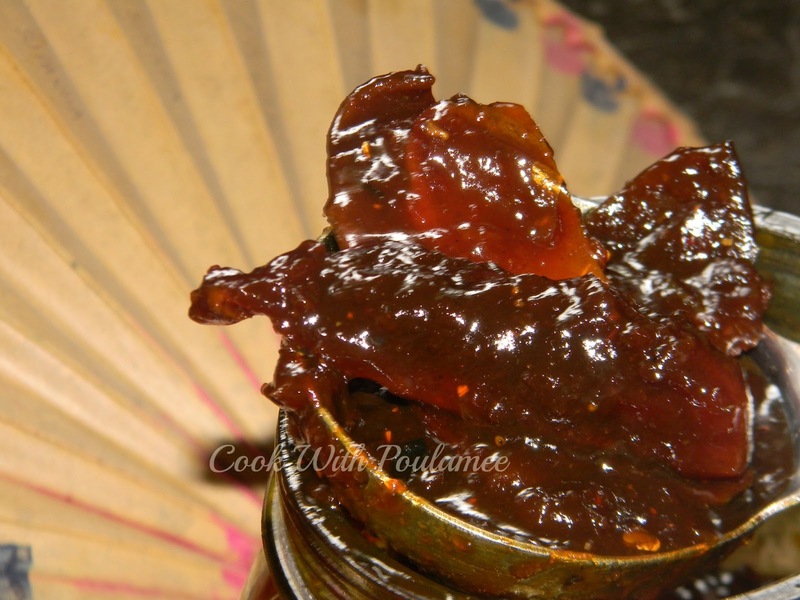 After frying all the mangoes add the dry red chilies into the vessel and slowly add the jaggery in liquid form or Jhola Gur into the vessel and cook till it become sticky. Then add the sugar and cook till it become sticky too. Now add the fried mango pieces and stir continuously till the mango pieces become mixed nicely and the jaggery stick nicely to the mango pieces. Now add the dry roasted fenugreek and fennel seeds and stir for some time. Now spread the pickle in a plate and keep it in sunlight for few days, and finally keep the pickle in a glass bottle for better taste. Labels: MANGO, MOTHERS RECIPE., PICKLE. satti ei sab jinis always osdharon re.